Tommy's first middle school dance is coming. But he won't be going. 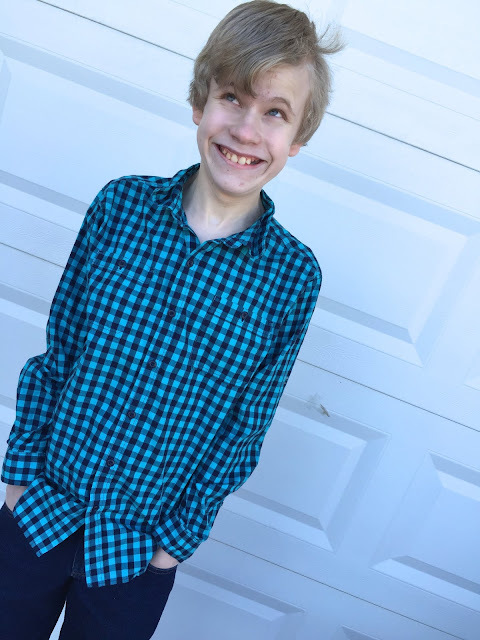 I hit on this in my Similarities And Differences On A Teenager With Autism post. I won't lie, I did press Tommy a bit to see if he'd go. I don't want him to think back to his teenage years when he's an adult and regret not going. But he's adamant. He doesn't want to be there and I will not force him. He explained to me why he didn't want to go and gave me permission to make a blog post out of his reasons. 1. He's worried they'll play One Direction or Justin Bieber. He cannot stand their music. 2. He thinks the people he goes to school with are too crazy. He says they like to walk around with their pants hanging low. He wonders why they don't wear belts or purchase pants that fit properly. 3. He doesn't want the kids calling him "Bruh." It makes no sense to him as they are not related so technically he is not their "bruh." He says they also say things like "Yo homie dawg." For the longest time he thought they were calling each other dogs and didn't understand. 4. Girls make him nervous. 6. He doesn't know what to say. "I'd probably just go talk to the teachers." He doesn't really talk to the kids at school. 7. Girls make him nervous. 8. He doesn't feel like dressing up. Dress shoes squeeze his feet. He's worried a tie will choke him. Maybe he'll go to high school dances or maybe he won't. I guess we'll see. Did you skip your school dances? If you have kids, did they go to theirs? I went to mine but mostly stood in a corner and talked with my friends. My shoes did squeeze my feet. I hope its ok as a mom of a teenage son, I laughed. Love the girls make him nervous :) And I think his reasons are bang on. Even though we homeschool my children are floored by the baggy pants (agree with belts, hello?!) and the nick names. They go to dances but usually sit on the sidelines, my son won't dance-he informs me that its dumb. My daughter will dance but only fast dances "thank you very much" (make sure you read those in the pre-teen snotty voice) lol Gotta love kids! Please let your son know he is not alone in these opinons =) great post! dances always stressed me out. i would get huge social anxiety but i always went to them! I went to a lot of mine too but I also had some anxiety. Amen to #1. Tommy is one smart guy. I hate dress shoes too. Sounds like you will be having a pizza night in which would probably be more fun anyways! Yes! And I'll dance with him to music we enjoy. I'm with you, I don't want my kids to look back on things and have regret. My daughter isn't into dances either, but she will go to school sporting events with her friends. Love this! However, my son would be the one in the middle of the dance floor doing terrible dance moves and thinking he's the best thing since sliced bread. Haha, that's awesome! I also danced weird too. It seems to me that both of my sons skipped most school dances, especially middle school. It was so much more fun to hang out at home with their friends who were also skipping the school dances. I don't remember any high school dances, except proms, but I did go to a few middle school dances. They were.. interesting. I mean, I wore neon! I hated dances in middle school. I was 5'8" in 6th grade, so no one wanted to dance with the tall girl. By high school I had a boyfriend (now husband) so we went to all of those. One of my boys loved dances, the other one didn't. I always let them decide. Omgosh I never went to middle school dances because I was bullied so much back then. I wasn't even a fan of homecoming or prom. Question tho-do you think he'd go if a girl asked him to the dance? No, I doubt he would. Girls terrify him. But then again...maybe? But then I'd worry the girl was just asking him to be mean? Some kids are assholes. Those all sound like fine reasons not to go. You should be so proud you have a sensible boy! Odds are if he did go, he'd have a rotten time. I went to only one dance in my life (middle school) and hated it! I regretted wasting my time going and did not go to prom either. Dances are not for everyone. Kudos to you for not forcing him to go! So very valid. I wouldn't want to go to a place where they played Justin Bieber either, haha. I did go to some of the dances when I was in junior high/high school, but I think I'd much rather have just stayed home and played video games, or just hung out with friends outside of em'. I wouldn't push him. I could see having a similar conversation when he's in high school, but even then it needs to be his choice. Maybe there's a different experience that will become his favorite memory. I went to all of my high school dances, and it was pretty awkward, but part of the growing up process too. I still remember having a blast with my friends the one year we all didn't have dates. I love that he does his own thing and doesn't care...! And bless him, love how girls make him nervous...! Hell, guys still make me nervous!! Some reasons are hilariously true, some are understandable for a boy his age. I really think it's nice that you're not forcing him to go and that you're letting him make his own decisions. He's very real and very honest, I love that! I think the number one reason is that "Girls make him nervous." He is on the stage where he is having crush and gets curious about real life. Well, I hope he can attend prom in the near future. To be completely honest I did not go to any of my dances and I still don't regret it. If you're not popular the dance really is no fun for you. It is really for most people that are popular at least in my opinion. He may never regret it and I'm glad that you're not making him go. Lol they will likely play a ton of Justin Beiber! I didn't go to my dances and don't regret it one bit! His answers make total sense to me!! I love his first one though, no One Direction of Bieber. Hahaha. I know a lot of kids that would feel the same way. My oldest daughter went to some of her school dances in middle and highschool. She said that nobody really danced, and that most people were all standing in huddles talking. My youngest is homeschooled, so no dance for her, but she totally wants to go to one, because she thinks that they are like what she has seen on The Disney Channel. From what I remember, they are a lot like my oldest daughter described. He's not missing out. As a school administrator, it used to break my heart seeing the kids that were forced to go. They look miserable, lonely and just want to die on the spot. I think parents who loved the dances want their child to experience them. I'm guessing those kids will be more accepting of their children's decisions not to attend. I love it! And girls make him nervous, lol. OH to be young again. And I completely agree with the crap music they will most likely play. It sounds like he really has thought about why he doesn't want to go and good on him, if it isn't for him. Perhaps he will feel differently in high school. "He's worried they'll play One Direction or Justin Bieber." I've left college parties for this reason. Re the "bruh" issue. I hope you've explained to him it's a greeting of acceptance and familiarity. AAVE is its own language, so someone greeting him as "bruh" is the same as spanish speaker calling him "amigo"
Hey you know dances are either fun or not. If you have friends you are meeting up with, fun, if you don't, not. I totally understand his reasons for not going and I wouldn't force my boys either. At least he knows himself enough to know what he doesn't like. I can't stand One Direction or Justin Bieber either, lol. It's okay not to go, I didn't go to mine before high school. I wasn't really into the junior high dances. High school dances were much more fun! My kids never went to school dances, except prom. Your son has some good reasons. Dress clothes are super uncomfy. I was bullied in high school so grew to hate the concept of dances and almost any other social event. My son goes to a contained school where he is the mayor and loved by many and I am happy to say he loves to go to their prom and dance. I didn't go to any middle school dances but my kids totally did. I love that their middle school experience wasn't anything remotely like mine. It's okay that your kid doesn't want to attend his middle school dance, it's not for everyone. It reminds me of my brother during his teenage days. He will be fine just take his time . I went to one dance and was anxious the entire time. My son went to prom last year but he is not a big fan of dances either. My daughters have went to quite a few dances. I was at every dance my school had. It is just something you don't want to miss out on! I hope he changes his mind and goes to one! I am sure he will have fun. These are all valid reasons. I don't blame him. Middle school dances were pretty awkward. He'll go when he's ready. He sounds like my oldest daughter! I try not to push to her go, but I used to love these things when I was around this age. She's very introverted, she always says: "I'd rather meet new people as characters in books." Awww I can totally understand his fears! I've had anxiety since I was in my young teens, so I can totally relate. I definitely didn't go to all the school dances! It's natural for us to feel like we don't want our kids to miss anything but if it's not their scene, it's totally fine for them not to go. I think these reasons are enough for him to not go, I just find #4 and #7 adorable! All of his reasons are totally valid; I wouldn’t want to be called bruh, or listen to Justin Bieber either! (Although One Direction isn’t too bad!) I don’t think he’s missing out on teenage experiences, especially if he wouldn’t enjoy them to being with! He sounds like an amazing kid. Growing up I always went to dances but I can understand why someone wouldn't be interested in going. I always went to mine and had lots of fun! I think that if he doesn't feel like going, it's ok...it's just a party after all, no big deal! 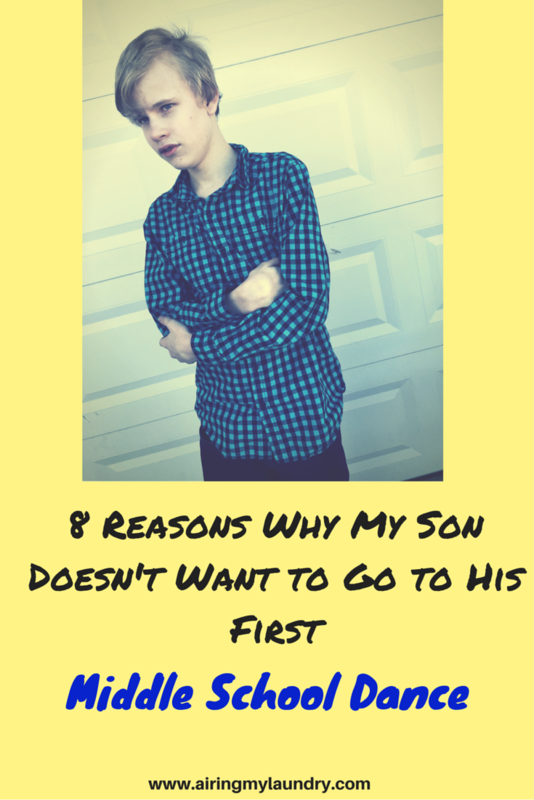 I can totally relate and I think your son's reasons are spot on. My youngest son was that way too. He had no intention of going to high school dances because of one reason - he just can't dance! But of course, he HAD to go because he was invited to be some girl's date. You could just imagine the exasperation on his face. He keeps saying, "I'd rather play basketball with my friends and be all sweaty than to wear dress shoes, a coat and a tie!" Makes me think that when he gets married in the future, he might want to wear basketball shoes and a jersey shirt. Ha ha. I think your son would probably have fun, but I can totally understand a middle school boy not wanting to go. Ultimately, I think it should definitely be his decision. It appears girls make him nervous. lol. But I totally agree with the Justin Bieber thing. I wouldn't want to hear him either. Your son is very smart - girls should make him nervous. They are for more interested in being seen as having a boyfriend than they are interested in the actual boy. They will use him to increase their social status in the eyes of other girls. He's wise to steer clear of them.